Sometimes you just want a little sweet treat. But you still want it to be good for you. These cookies are always what does it for me when I’m feeing that way, which is usually when I’m working on a big writing project on a weekend afternoon or well, just before that time of the month. They’re also a fast treat to whip up for hungry kids, for hunkering down in front of a movie with the family, or anytime you’re having guests over for dinner. And unlike some healthy or Paleo treats – they taste like the ‘real’ thing, not healthy cardboard! 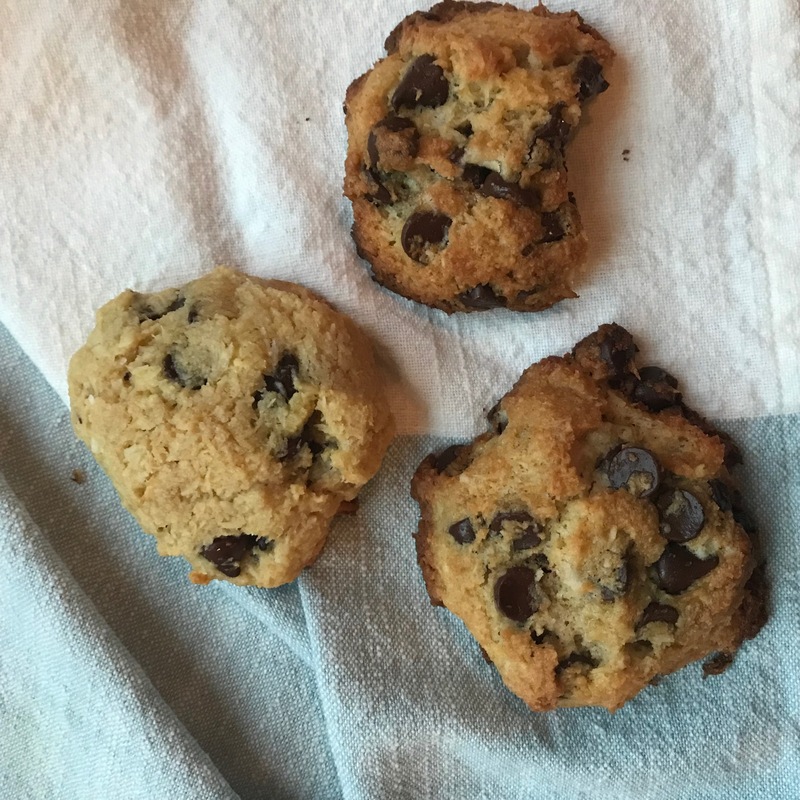 This recipe makes 8 medium sized cookies in about 15 minutes start to finish, and is courtesy of my daughter, Mima Romm, who is a talented natural foods chef. In a medium sized mixing bowl mix together the shredded coconut, almond flour, baking powder and salt. In a separate small mixing bowl, whisk together the egg, maple syrup, coconut oil (room temperature) and vanilla extract. Add the chocolate and stir until evenly distributed throughout. Place onto cookie sheet about 1 ½ inches apart. Bake for 10 minutes or until golden brown. Be careful not to overcook them, they go from perfect to burnt really fast. Let firm up for a few minutes on the cookie sheet then transfer to a baking rack. I made these today and they are delicious! One question, should they be stored in the fridge, cupboard or frozen? I want the remainder of the batch to be as yummy as the one I had today. Thanks for your help. Hi Linda, If they are going to be around for more than a day - which is rare - we refrigerate them. Of course it depends on the season and how warm it is in the house, but definitely err on the side of keeping them cool. Great recipe. My husband even enjoyed them. And that’s not the case with some other gluten free recipes. :) That's awesome! It's one of those where you get - wait, those were all natural? No way!